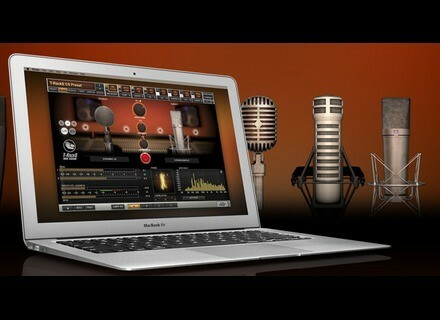 T-RackS Mic Room, Microphone simulator from IK Multimedia in the T-Racks series. What would a recording made with [such microphone] sound had it been done with [such other microphone]? Well, that's what re-miking is all about and IK Multimedia's new T-Racks Mic Room provides its own answers to such questions with 20 modeled popular studio microphones. Mic Room is a T-RackS module (hence it can be used either inside T-RackS or as a standalone plug-in) which was designed to be placed on individual tracks containing recorded audio from a microphone source (vocals, acoustic guitars, miked electric guitar amps, drum tracks, you name it). 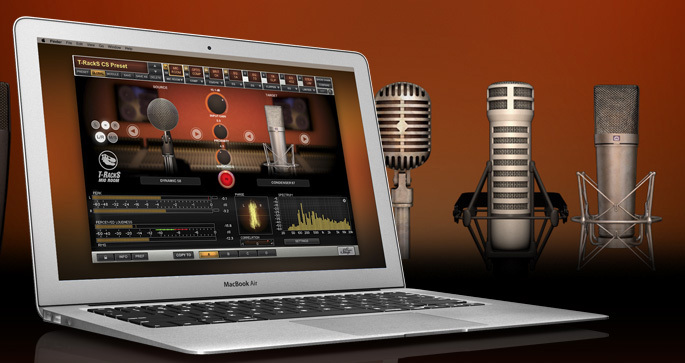 Once placed on the track, T-RackS Mic Room lets users choose the "source" microphone that was actually used to capture the original audio from a list of all the available models in the module, then choose a new microphone to re-mike the character of their original recording to match the specific nuance, color and tonal character of the mic they'd like for their mix. Each microphone model can be tweaked to deliver the best sound possible thanks to an intuitive graphic interface that provides an easy-to-read level meter and a touch-and-drag gain knob. Users are also given a certain level of creative control with a "proximity" knob (which emulates a real mic's proximity effect) and also a possibility to control the harmonic content of the signal for a warmer, more complex signal. While according to the brand Mic Room can liven up the character of any microphone, it is also said to works best when paired with the brand's iRig Mic Studio, iRig Pro DUO, iRig PRO, iRig Mic HD, iRig Mic and other microphones and interfaces from IK Multimedia. MSRP is €69.99 (taxes not included). Detailed features available at www.ikmultimedia.com. Plugin Alliance launches Xmas calendar sale Black Friday and Cyber Monday are just over and Plugin Alliance already starts another sale with a new offer available everyday until Christmas. Rhythmic Robot release vol2 of Emulator II library Rhythmic Robot has released volume 2 of its Emulator II OMI Universe of Sounds bank for Kontakt. [BKFR] 40% off selected products at Steinberg Through the weekend, Steinberg offers 40% off a selection of four of its instruments and tools.